HOURS: Daily: 12 Noon to 11:30pm. 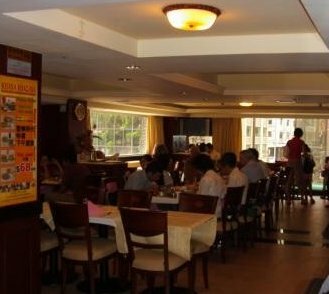 DESCRIPTION: Khana Khazana is the only Indian vegetarian restaurant on Hong Kong Island and has been featured on local TV channels, magazines and newspapers. Combining North Indian, South Indian and Fusion Food, their chefs constantly experiment, offering their guests new culinary delights. CUISINE: North Indian, South Indian and Fusion Food (Italian & Chinese dishes cooked Indian style). SERVICE: Full Service, Buffet, Take-out, Catering and Delivery. SPECIALTIES: Tandoori Platter, Pani Puri, Sev Puri, Idli, Dosa, Uttappam, Indian Pizza, Momos, Manchurian, Kulfi. FEATURES: Quiet and comfortable ambiance in the heart of entertainment district. Full bar with extensive range of wines, beers and liquors. Always experimenting with food, their chefs are ready to surprise their guests with new dishes. NON-SMOKING: Our restaurant is completely non-smoking. CREDIT CARDS: We accept American Express, MasterCard and Visa. DIRECTIONS: 2 minutes walk from Wan Chai MTR Station Exit C. On the junction of Jaffe Road and Luard Road, building entrance opposite Delaney's. Valet parking available on weekday evenings, all day weekends and public holidays. We're co-sponsoring the Ngong Ping World Vegetarian Food Fair throughout November in Hong Kong! Includes entertainment and veg recipe competition. Check our website for more info! "I happened to visit this place after seeing immence publicity in tourist maps and also by word of mouth as I am a frequent visitor to HK, but always had a sad experience in many eating places in TST with names to go with India and other Indian cities. But this place has awesome food. I tried their lunch buffet. For the first time in past so many years I did not miss India for food. It was just excellent. Apart from the food, even the staff is so nice that they make you feel at home. I was told that they have opened 2 more places which are Thai and non veg. I really wanted to try but due to shortage of time could not. Next time will surely visit you guys." "This is a great restaurant in the heart of the entertainment area and a fully vegi one too. The food was fantastic and so were the people. I mostly go to the Vegi place in Kowloon side but compared to KhanaKhazana I must say they lack everything a good restaurant should have. I will recommend this place to all who I know are vegetarians." "Hi, I am a vegetarian and visited Khana Khazana few days back. I really must compliment the quality of food and the service. It was my second experience at the place and I must say that the first one was not pleasant. This visit the place smells good and the atmosphere is different (warm & cosy). It was good to see families with kids. Another surprise was when the chef walked out and presented us a fusion veg dish. Which was really nice and made us feel important as a client. I would certainly visit them again along with family and friends."